Egypt's state prosecutor refers ousted President Mohammed Morsi for trial on charges of inciting the murder of protesters. Egypt's state prosecutor said on Sunday he has referred ousted President Mohammed Morsi for trial on charges of inciting the murder of protesters, the BBC reported. The accusations relate to violence outside the presidential palace in Cairo last December when seven people were killed in clashes. Fourteen other members of Morsi’s Muslim Brotherhood are to stand trial on the same charges, according to the BBC. The state prosecutor referred the former president for trial late on Sunday, Egypt's state media reported. The report said he would go on trial on charges of "incitement to murder and violence" in December 2012. The deposed president has previously been accused of the "premeditated murder of some prisoners, officers and soldiers" when he and several Muslim Brotherhood leaders were freed during a breakout at a Cairo prison in January 2011. He is also alleged to have plotted attacks on jails in the uprising that overthrew President Hosni Mubarak and of conspiring with the Hamas terrorist group in this plot. 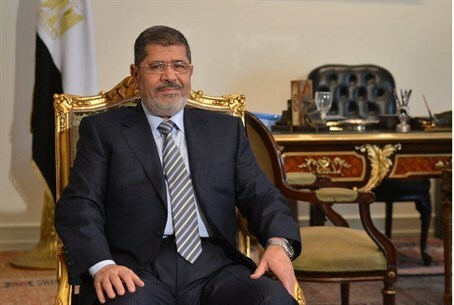 Morsi has been held by the army since his overthrow on July 3. His location remains unknown to the general public, though several foreign diplomats who have visited Egypt visited him. The army-backed government has arrested most of the leaders of the Muslim Brotherhood since Morsi was toppled on July 3, including the movement’s Supreme Guide Mohammed Badie. Violence has been on the rise since Morsi was ousted and it peaked on August 14 when police cleared two Brotherhood-led sit-ins in the capital, killing more than 600 people. The move caused days of nationwide violence that has killed more than 1,000 people, most of them Morsi's supporters. Many of Morsi’s supporters have retaliated by attacking police stations, torching churches and setting government buildings on fire.